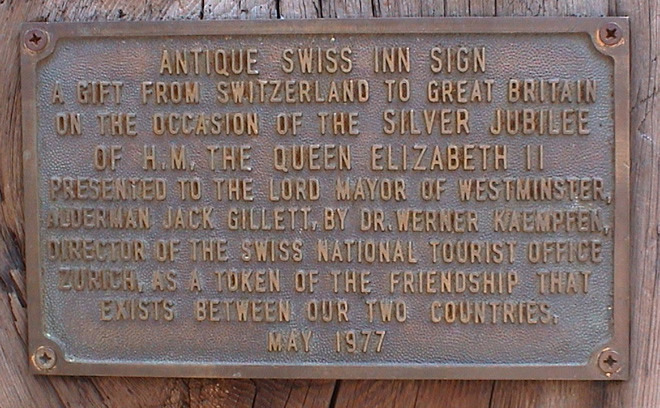 On 15 April 1991, on the occasion of the 700th anniversary of the Swiss Confederation, the Right Worshipful the Lord Mayer of Westminster, Councillor David Avery named this area 'Swiss Court' as a token of the lasting friendship between Switzerland and the United Kingdom. A gift from Switzerland to Great Britain on the occasion of the Silver Jubilee of H.M. The Queen Elizabeth II. Presented to the Lord Mayor of Westminster, Alderman Jack Gillett, by Dr. Werner Kaempfen, Director of the Swiss National Tourist Office Zurich, as a token of the friendship that exists between our two countries, May 1977. Until 2007 the north-east corner of this junction was occupied by the 1968 Swiss Centre. The facade of the building was adorned with an array of working bells and an animated cavalcade of Swiss stereotypes such as cowherds, mountains, cows, etc. Clockwork, presumably. Installed in 1985, Westminster Council decreed that the clock should be reinstated on the new building, due to open in 2011. 2019: Londonist shows the reinstalled glockenspiel, plus some brief images of how it used to look. It looked much better in its original incarnation. Director of the Swiss National Tourist Office, Zurich.